Having not heard from her husband for a full month, Lady Isabelle decided she would quit the Summer residence at once and return to her estate. The Altgraf himself had been much distracted of late and she would not be surprised to discover him with some concubine no older than their daughter. Nor, if she were honest, did she much care. She simply wanted to catch him at it and then to stand silently as he tried to find a way to apologise without compromising his preferred manner of condescension towards her. The manor stood empty, with not even the servants remaining. As much mystified as troubled, Isabelle looked for signs of trouble, but found none. She returned to her chamber and debated whether to have her maid unpack her things, or if she should leave at once for her uncle’s estate and await news there. Whilst contemplating this decision, Isabelle glanced into her mirror and saw on the other side of the room a tall man in a robe with some vast hat upon his head. No, not a hat but a quivering mass of some dark weed, wet with oil. She span around at once, drawing breath to shout for help, only to discover the room was empty. She was so paralyzed with fear that she could make no sound at all. She turned back to the mirror then, hoping to convince herself she had imagined the apparition. It was in almost the same place, just a little closer. 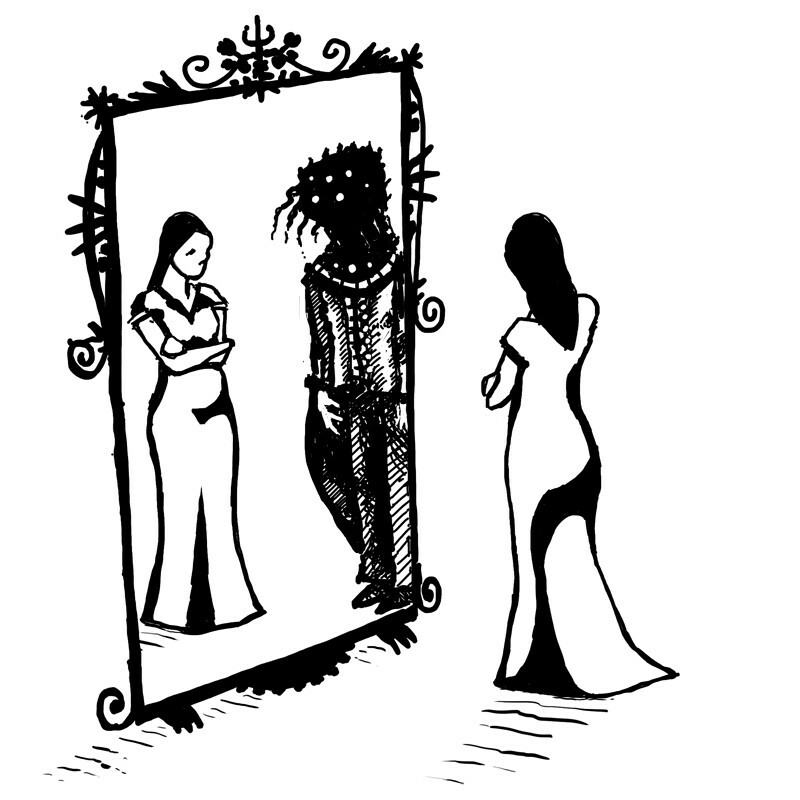 Lady Isabelle sat motionless, watching in the mirror has the horrible figure approached her. When it was almost at her side, her maid opened the door. Suddenly emboldened, she cried out and ran from the room and did not stop running until she reached the edge of the meadow. The summoners of the County of Narthul called many dangerous beings to their service from higher levels of the stairway. Of the various disasters thereby caused, none was so serious in its consequences as the calling of the Half Lords. Called ‘Nether Lords’ by the Count’s scholars, the Half Lords were a group of sorcerors from high up the stairway skilled in mirror secrets. They had long since dispensed with their bodies in the mortal world and existed only in the mirror realm. From there they were nonetheless able to exert great influence via their secrets. The Half Lords primarily spend their time in pursuit of perpetually increasing their already impressive longevity. The mortal world contains many resources suitable for this end and consequently once summoned to it they set about taking control of it. Narthul itself fell to their plots, then the adjacent nation of Sarenland. They took effective control of Owl’s Crossing, the Northernmost of the Seats of Urthauld. Their forces also invaded and successfully occupied the Lossanbrant, but they never entirely overthrew its government and with the aid of some of the other Seats the Lossanbrant eventually defeated the invaders. Ultimately the Half Lords were almost all hunted down and slain by members of the Order of Cartographer adepts. The Half Lords never controlled a large army. They used their secrets to create mirror soldiers, who either seemed unarmed in the mortal world or were entirely absent from it. Such soldiers were enormously effective against most opposition. Nor could they ever have controlled a large army or successfully administrated any of the nations they conquered. To begin with they themselves were not numerous, but also they spent most of their time obsessively studying sorcery. Indeed, by any reasonable measure they were almost all insane, unable to think much beyond their obsession with their own eventual demise. The Half Lords can speak mortal languages and, if called or discovered somehow, will initially seek to appear benign and reasonable in order to lure others into furthering their ends.